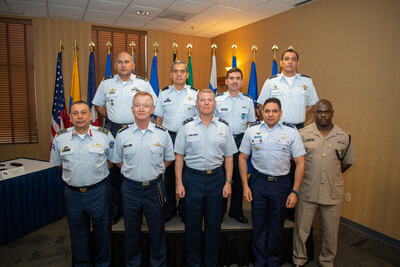 DAVIS-MONTHAN AIR FORCE BASE, Ariz., Nov. 13, 2018 — Twelfth Air Force (Air Forces Southern) hosted the Central American and Caribbean Air Chief’s conference with participants from Colombia, Dominican Republic, El Salvador, Guatemala, Honduras, Jamaica, Mexico and Panama, Nov. 6-8, 2018. Eight countries participated in the three-day conference, which focused on humanitarian assistance and disaster response and how to leverage air force partnerships in those areas. Each participating Air Force representative shared information on their own unique capabilities as well as past challenges and successes. The Air Chiefs or their representatives also received information about the System of Cooperation among the American Air Forces (SICOFAA) and the Inter-American Air Forces Academy (IAAFA). Representatives from State Air National Guards partnered with South American Air Forces through the State Partnership Program also attended the conference. “We can do things alone, but together, we can reach greater success,” stated Gen. Quintana. Additionally, participants discussed the importance of the enlisted force to air force operations and visited the 612th Air Operations Center and the 309th Aerospace Maintenance and Regeneration Group during the conference. This conference is an example of 12th Air Force’s (Air Forces Southern) enduring partnership with Latin American Air Forces and reflects the United States’ enduring promise of friendship, partnership, and solidarity with the Americas.